The ASRS Automatic Loading Trolleys have been designed for a new Acres client. The client, a west midlands based Automotive OEM required a tow trolley solution to support the integration of two Automatic Storage and Retrieval Systems (ASRS) at their Solihull and Castle Bromwich sites. The tow trains consist of two trollies designed to be coupled in pairs and to link to existing Linde P60 tow trucks used on site. 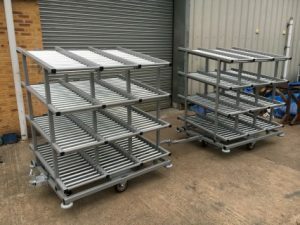 Each trolley is capable of holding a maximum of 24 off totes (maximum 15kg each) across 12 off gravity conveyor lanes built in to the structure. These gravity lanes are installed on 4 levels x 3 lanes wide and are designed to suit the outfeed of the automatic trolley loading stations on the ASRS system. The design of the trolley has been considered to be such that the pitch between them when coupled will allow accurate alignment with the automatic trolley loading stations, allowing two trolleys to be loaded at the same time. Each trolley has been set on a powder-coated steel support chassis approximately 1300mm wide x 1500mm long. The chassis is supported on 2 off small diameter towing wheels specified to suit the load. In addition to the chassis transport wheels a further 4 of small ~Ø125mm diameter outrigger wheels are mounted vertically in close proximity to the corner of each chassis. These wheels are designed to stabilise and accurately locate the trolley on the lead in to the automatic trolley loaders. The wheels will act against a floor mounted guide rail system when towed into position prior to the loaders.